located at Piccadilly Circus, Criterion Theatre is home of Mischief Theatre’s The Comedy About a Bank Robbery. Criterion Theatre is easy to access using public transportation. The nearest train station is Charing Cross Station. The nearest tube stations to the Criterion Theatre are Piccadilly Circus (Bakerloo/Piccadilly Lines) and Leicester Square (Northern/ Piccadilly Lines). The Criterion Theatre is serviced by bus lines 3, 6, 9, 12, 13, 14, 15, 19, 22, 23, 38, 88, 94, 139, 159, and 453. The nearest car park to the Criterion Theatre is the Q-Park Chinatown. The Criterion Theatre is a London West End theatre situated on Piccadilly Circus in the City of Westminster, and is a Grade II* listed building and has an official capacity of 588. In 1870, the caterers Spiers and Pond began development of the site of the White Bear, a seventeenth-century posting inn. A competition was held for the design of a concert hall complex, with Thomas Verity winning out of 15 entries. He was commissioned to design a large restaurant, dining rooms, ballroom, and galleried concert hall in the basement. The frontage, which was the façade of the restaurant, showed a French Renaissance influence using Portland stone. After the building work began, it was decided to change the concert hall into a theatre, and thus The Criterion Theatre was born. The composers' names, which line the tiled staircases, have been retained and can still be seen. The redesign placed the large Criterion Restaurant and dining rooms above the theatre, with a ballroom on the top floor. When Spiers and Pond applied for a licence to operate, the authorities were unhappy because The Criterion Theatre was underground and lit by gas, creating the risk of toxic fumes. The Metropolitan Board of Works had to vote twice before the necessary licence was issued, and fresh air had to pumped into the auditorium to prevent the audience from being asphyxiated. It was not until October 1881, at the Savoy, that the first theatre was lit electrically.The building was completed in 1873 with the interior decoration carried out by Simpson and Son. The first production at the Criterion opened on 21 March 1874, with the programme consisting of An American Lady written and performed by Byron and a piece by W. S. Gilbert, with music by Alfred Cellier, entitled Topsyturveydom. Gilbert was back at the theatre in 1877 with his farce, On Bail (a revised version of his 1874 work, Committed for Trial); in 1881, with another farce, Foggerty's Fairy; and in 1892, with a comic opera, Haste to the Wedding, with music by George Grossmith (an operatic version of Gilbert's 1873 play, The Wedding March). Haste to the Wedding was a flop, but it introduced the 18-year old George Grossmith, Jr., the composer's son, to the London stage. The younger Grossmith would go on to become a major star in Edwardian musical comedies. Management of The Criterion Theatre transferred to Charles Wyndham when he became the lessee in 1875 and under his management becoming one of the leading light comedy houses in London. The first production under this new manager was The Great Divorce Case, opening on 15 April 1876. When Wyndham left in 1899 to open his own theatre, The Wyndham's Theatre (and then the New Theatre, now called the Noel Coward Theatre, in 1903) he remained the lessee of the Criterion however, bringing in various managements and their companies. In March 1883 The Criterion Theater closed for alterations demanded by the Metropolitan Board of Works. The pumping of fresh air into the ten year-old auditorium, some thirty feet below street level, was deemed unsatisfactory. Thomas Verity supervised the alterations (Verity by now had also designed the Comedy Theatre in 1881 and The Empire Theatre in 1882). The new direct access ventilation shaft meant cutting off a considerable portion of the adjoining Criterion Restaurant. New corridors were built, with several new exits. The auditorium was reconstructed and the stage re-equipped. The old dressing rooms were demolished and new ones built. Most importantly, electricity was installed. Dramatic Notes (1884) states The Criterion Theatre, transformed from a stuffy band-box to a convenient, handsome, and well ventilated house, reopened on April 16". Further alterations and redecorations took place in 1902-03, when the theatre was closed for seven months. Between the world wars productions at The Criterion Theatre included Musical Chairs with John Gielgud and in 1936, a three year run of French Without Tears which launched the career of Terence Rattigan. During World War II, The Criterion was requisitioned by the BBC - as an underground theatre it made an ideal studio safe from the London blitz - and light entertainment programmes were both recorded and broadcast live. After the war, The Criterion Theatre London repertoire included avant-garde works such as Samuel Beckett's Waiting for Godot and pieces by Anouilh, Dario Fo and others. In the 1970s The Criterion Theatre site was proposed for redevelopment, which caused protest as people feared the theatre would be lost. In February 1975 the GLC Planning Committee approved the development on the condition that the theatre continued in full, continuous and uninterrupted use while the redevelopments took place. Throughout the 1970s and early 1980s the row increased and the Equity Save London's Theatre Committee organised high profile demonstrations (campaigners included John Gielgud, Edward Woodward, Diana Rigg, Robert Morley and Prunella Scales) as they feared that the theatre would still be lost. In the 1980s, The Criterion Theatre building was purchased by Robert Bourne, a property tycoon and patron of the arts, and his wife, theatre impresario Sally Greene. The couple set up the Criterion Theatre Trust, a registered charity created to protect the Criterion's West End future. From April 1989 to October 1992 the theatre was closed whilst it underwent major renovations both in the back and front of the house. During that time, the block that exists today was built around it. After the refurbishment, the Criterion retains a well-preserved Victorian auditorium with an intimate atmosphere. 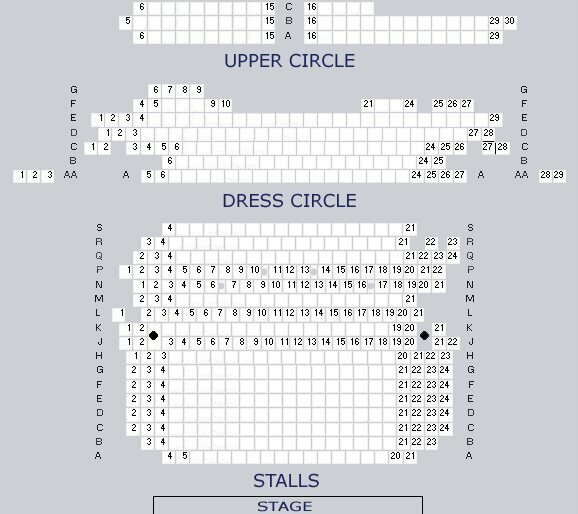 The Criterion Theatre has a capacity of 588 over 3 levels: Stalls, Dress Circle, and Upper Circle.